Pentax has launched a new entry-level DSLR featuring an unconventional design with flashing green LED lights in the handgrip. Boasting some ‘user-friendly’ modifications and available in 12 colours, Pentax are hoping the new K-S1 appeals to consumers yet to switch to a DSLR. We get under the hood to find out more. With the 2014 World Cup in Brazil approaching, this is the time manufacturers with serious interests in professional sports start revealing new cameras and lenses to selected press agencies. Both Canon and Nikon are rumored to be fielding prototype professional-level APS-C bodies during the tournament for testing. However, rival Sony appears to have stolen a march by introducing the SLT Alpha 77 II ahead of the games. Nikon’s incremental revisions to their entry-level D3000 series cameras means the latest model, the Nikon D3300 can compete with most other models in the range and should prove tempting against rival offerings. Read on to find out how the 24-Mpix sans AA filter D3300 performs. Although the Pentax K-5 II and K-5 IIs have now been replaced by the Pentax K-3, we’ve analyzed the two models with a range of lenses from both Pentax and third-party makers and thought the results would be of interest to our readers. The information is available online but we taken the opportunity to offer a brief overview of the best performing models. Read on to see how well the lenses perform together on the two cameras. 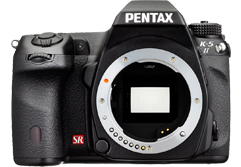 After the success of the 16-Mpix K-5II and K-5IIs without AA filter, Pentax has replaced the pair with a new flagship model, the K-3, with a 24-Mpix sensor boasting a user-selectable AA filter for control over moiré and sharpness, depending on the situation. Read on to find out how this unique sensor performs? Although the new Nikon D7100 looks fairly similar to its predecessor (the popular Nikon D7000), Nikon has made some significant changes under the hood that belie the surface similarity. The D7100 not only includes a higher-resolution CMOS sensor, but even more significantly, the company chose to use a sensor without an anti-alias filter for the first time on a non-full-frame DSLR. While this should enable better sharpness and resolution, it may also result in more moiré patterns in some images.